There’s often not much that separates a so-so outfit from a special one, or a superb haircut from a subpar one. The truth is that looking your best isn’t about dropping wads of cash on new clothes. More often than not, it’s the little things that make a big difference. To that end, here are 13 low-effort, high-impact tips you can try now to step up your style game in a split second. The internet is great for buying pants, well, in your pants, but online shopping can come a cropper where sizing is concerned. Since one label’s ‘small’ is another’s ‘large’, it’s worth knowing your exact measurements and consulting brands’ and retailers’ online size guides before wasting cash on a shirt that could double up as a sail or shorts that look more like three-quarter lengths. If you’re unsure exactly what or where you should be measuring, consider getting a professional involved. It might sound expensive, but it’s not. A local tailor or alterations specialist will be able to give you a full set of accurate readings and, in the long run, save you time, effort and money. Alternatively, if the store you’re buying from includes individual product dimensions, try measuring a similar item you already own that fits perfectly and compare against this before snapping up that bargain in the sale. Sure, you could shell out a month’s rent on a designer cashmere-blend suit, but if the fit’s not right, your style will still look cheap. On the other hand, high street tailoring can look considerably more expensive than it is with a few well-judged nips and tucks from a savvy tailor. 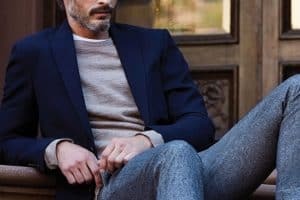 And suits aren’t the only thing you can get professionally altered – whether you have your jeans hemmed, chinos cropped or Oxford shirts darted for a more streamlined fit, these seemingly minor alterations to your wardrobe basics don’t cost much, but can make you look a million bucks. Given the amount of wear they probably get, it’s little surprise that some of your favourite pieces can sometimes develop a bit of an off-putting funk. For a quick freshen up, try an at-home impromptu dry-clean by hanging the offending item up on the bathroom door while you take a hot shower. Alternatively, use a time-honoured tipple as a treatment for smelly clothes. Fill an empty spray bottle with a little vodka, apply onto the affected garment and leave in a well-ventilated area to dry. Much like hand sanitiser, vodka kills odour-causing bacteria, leaving your wardrobe mainstays smelling good as new. And not like a Russian sailor on shore leave. Deciding what to wear the following day before hitting the hay the night before means you’re likely to have more time (and energy) to get the little details right. That said, if – between conference calls and circuit workouts – time’s tight during the week, get ahead at the weekend instead. Set aside an hour on Sunday to put together five to ten failsafe looks that work for a variety of occasions (office-appropriate, smart-casual, weatherproof, etc.) and then snap them on your smartphone. That way, if Tuesday night’s date has you running late Wednesday morning, you can easily reference your key combinations to pull something sharp together in no time. Add more looks as you buy new pieces or experiment with colour pairings and soon you will have a pocket database full of outfits to call on at a moments’ notice. If you feel like you’re living a kind of sartorial Groundhog Day, then it might be time to start switching up elements of your go-to outfits. Try something as simple as subbing in trainers for smart shoes (and vice versa), or a T-shirt for an Oxford shirt. It could be just the extra something your look needs. Or, for a complete wardrobe overhaul, start with a clear out then identify the gaps in your rotation and build up from there with interchangeable pieces that form easy go-to looks every day of the week. Who needs a bag, right? Another thing not to forget – along with your sunglasses, keys, phone or umbrella – when you leave a restaurant post-lunch, a bag might seem like an unnecessary hassle, but unsightly bulges in your trousers or suit jacket are worse. Provided you invest in the right design, a good bag will vastly improve your life (no, really) and your look. A sleek leather backpack in black, grey or navy leather is a practical option that can elevate weekend looks, or try a more eye-catching premium tote for a way up injecting life into a staid suit. Leather is only really as good as you keep it. That’s to say if you spend a week’s wages on a well-crafted holdall or even more on a timeless biker jacket, then you’d better take care of it if you want it to last. Always wipe leather goods clean of stains with a damp cloth and treat them regularly with a leather conditioning cream to prevent excessive dryness. If your go-to jacket, bag or wallet is looking worse for wear, track down a specialist. A leather expert will be able to re-colour leather products, skim over scuffs and replace broken handles – instantly revitalising your look in the process. Like it or not, your shoes are one of the first things people notice about you, so it makes sense to invest in a few tools to keep them looking box fresh. Small nicks and scratches can take even the nicest pair down a notch instantly, so remembering to regularly clean and polish leather styles is vital not only to keep them looking their best, but ensure longevity. Well-polished shoes also subtly communicate that you’re a man who takes pride in his appearance and pays attention to the finer details. As for suede styles, don’t underestimate the importance of a dedicated brush to dislodge debris and a suede protector to reduce the risk of pesky watermarks. And finally, a trusty packet of shoe wipes comes in handy for keeping sneakers looking pristine. Coordinating leathers is an easy way to bring cohesion to an outfit. We’re all for mixing navy, black and brown when it comes to clothes, but any leather items – be it a belt, piece of jewellery, bag or pair of shoes – always look better tonally matched. With this in mind, opt for similar (they don’t have to match exactly) shades of brown – i.e. tan, chestnut or chocolate – or match black with black (or, at a push, shades of grey) to bring a solid through-line to your ensemble. Having good posture comes with more than just benefits for your health. Standing up straight will make your clothes fit and drape better, and it can even make you appear more confident, open and (according to some) successful. If you’re unsure how to achieve (and maintain) good posture, picture a thread running through your body, holding your head up. Keep that image in mind throughout the day – make sure your head’s held up high, your back is kept straight and your chest out. Another solid tip for maintaining good posture is to imagine that you’re wearing your best suit, even if you’re in something as casual as a T-shirt and jeans. Given that we usually feel more confident and less likely to take prisoners in a suit, mentally picturing yourself in one even in your downtime can help you to stand tall rather than slouch. Whatever your manscaping method of choice, there are very few male bodies that can’t benefit from a little regular grooming. And rather than always concentrating on your balls, consider the areas that are more regularly on show (we hope). Take time every couple of weeks to rid yourself of a burgeoning monobrow, or ask a barber to tidy your eyebrows whenever you have your hair cut. Pay equal attention to places like the neck, checks, ears and nose, which all sprout hair that is easily brought under control using a good quality trimmer. And as for below the belt? Well that’s a subject in itself. A badly fitting suit or misjudged colour combination both have one saving grace – you can take them off at the end of the day. A shoddy haircut, however, isn’t so easily fixed. If you’re looking to lift your look, drop by a decent barber. A good haircut can instantly boost your confidence whatever you’re wearing from the neck down. Before having the deed done, do your research. Learn, and discuss with your barber, which hairstyle(s) suits your face shape and lifestyle, and be sure to go back regularly (every two to six weeks, depending on your style) to keep your barnet looking its absolute best. We’re not necessarily talking about upgrading your scent here, but rather having a signature scent that is unmistakably yours. This technique is the psychological equivalent of slipping on a trusty pair of brogues or buttoning up a perfectly fitted shirt. Much like clothes, fragrance is another facet of our appearance we can customise to leave a lasting impression. Start with a tried and tested classic, before branching out into more niche and boutique options.